Two new reports from Forrester, the summaries sound interesting. 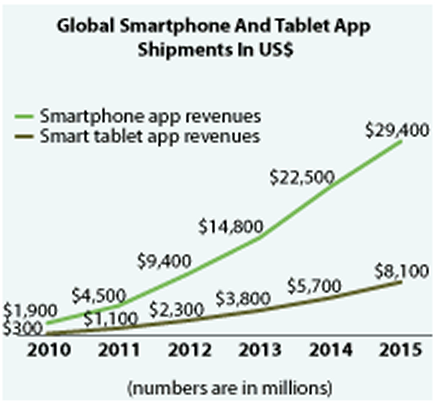 Forrester have forecast global app sales, spit by smartphone and tablet, up to 2015. Their report covers the development of further innovations such as how cloud-based services, smart computing and app enabled devices will spread beyond the mobile and slate to devices such as cars, entertainment systems and appliances. In this report Forrester’s key insight concerns their belief that IT managers and vendors are underestimating demand for mobility solutions in the corporate space; by assuming mobile applications are more relevant to mobile staff – rather than office based staff as well. Forrester identify two b2b end-user segments that are underserved by Enterprise IT; Mobile Wannabes and Mobile Mavericks. –	Mobile Wannabes are desk based staff, but they elect to buy smartphones or slates for work, and demand Enterprise apps and IT support to go with them. –	Mobile Mavericks include more mobile (less desk-centric) employees and use smartphones for work. But they go outside of the corporate purchasing process; selecting and purchasing their smartphones and work-related mobile apps on their own. Combined, these two worker segments currently account for 22% of all employees; by 2015, they will grow significantly to 42% of all corporate employees according to Forrester. Reviewing Enterprise communication and security arrangements to facilitate and support more mobile device-centric business functions is adding a wave of complexity; demanding more flexible controls and security services from IT managers. But vendors in the mobility ecosystem are recommended to modify their product road maps to target these mobile worker segments.